Sunday we had family coming over for dinner and my husband informed me we were fixing Spaghetti for dinner (his favorite, not mine). I've made these breadsticks several times and I love them 1st for the taste, and 2nd for the quickness in whipping up a batch. I found the recipe at one of my favorite recipe internet stops My Kitchen Cafe. Enjoy! *Makes about 20-25 breadsticks, depending on how thick or thin you cut them. Mix all ingredients (except melted butter) in a large bowl or electric mixer and knead for three minutes. Let the dough rest for 10 minutes. Heat oven to 375 degrees. Spread melted butter onto an 11X17-inch baking sheet. 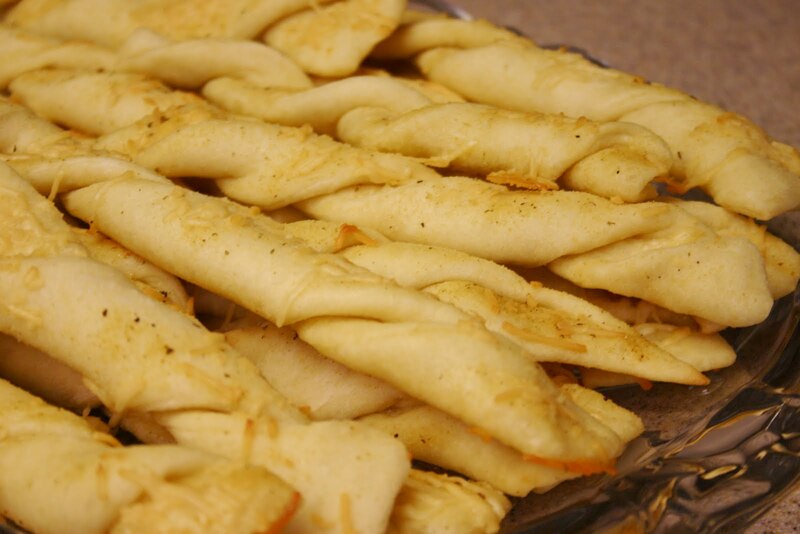 Roll out the breadstick dough about 1/4 to 1/2-inch thick and cut into strips with a pizza cutter. Twist slightly if desired and place about 1/2-inch apart on the baking sheet. Sprinkle with garlic salt, herbs of choice and parmesan cheese. Cover with greased plastic wrap and let rise 30 minutes. Bake 15-20 minutes at 375 degrees until golden brown.